Nubia (/ˈnuːbiə, ˈnjuː-/) is a region along the Nile river encompassing the area between Aswan in southern Egypt and Khartoum in central Sudan. It was the seat of one of the earliest civilizations of ancient Africa, with a history that can be traced from at least 2500 BC onward with the Kerma culture. The latter was conquered by the New Kingdom of Egypt under pharaoh Thutmose I around 1500 BC. Nubia was home to several empires, most prominently the kingdom of Kush, which conquered Egypt during the 8th century BC during the reign of Piye and ruled the country as its Twenty-fifth Dynasty (to be replaced a century later by the native Egyptian Twenty-sixth Dynasty). The collapse of Kush in the 4th century AD after more than a thousand years of existence was precipitated by an invasion by Ethiopia's Kingdom of Aksum and saw the rise of three Christian kingdoms, Nobatia, Makuria and Alodia, the last two again lasting for roughly a millennium. Their eventual decline initiated not only the partition of Nubia into the northern half conquered by the Ottomans and the southern half by the Sennar sultanate in the 16th century, but also a rapid Islamization and partial Arabization of the Nubian people. Nubia was again united with the Khedivate of Egypt in the 19th century. Today, the region of Nubia is split between Egypt and Sudan. The primarily archaeological science dealing with ancient Nubia is called Nubiology. Nubia was divided into three major regions: Upper, Middle, and Lower Nubia, in reference to their locations along the Nile. Lower refers to regions downstream and upper refers to regions upstream. Lower Nubia lies between the First and the Second Cataracts, within the current borders of Egypt. Middle Nubia lies between the Second and the Third Cataracts. Upper Nubia lies south of the Third Cataract. A pair of Nubians, from the royal palace adjacent to the temple of Medinet Habu, from the reign of Ramesses III (1182-1151 BC). Meroë (800 BC – c. AD 350) in southern Nubia lay on the east bank of the Nile, about 6 km north-east of the Kabushiya station near Shendi, Sudan, ca. 200 km north-east of Khartoum. The people there preserved many ancient Egyptian customs, but were unique in many respects. They developed their own form of writing, first utilizing Egyptian hieroglyphs, and later using an alphabetic script with 23 signs. Since king Arakamani the kings were buried in Meroe. 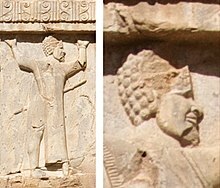 The Achaemenids occupied the Kushan kingdom, possibly from the time of Cambyses (circa 530 BCE), and more probably from the time of Darius I (550-486 BCE), who mentions the conquest on Kush (Kušiya) in his inscriptions. Strabo describes a clash with the Romans in which the Romans defeated Nubians. According to Strabo, following the Kushite advance, Gaius Petronius (a Prefect of Egypt at the time) prepared a large army and marched south. The Roman forces clashed with the Kushite armies near Thebes and forced them to retreat to Pselchis (Maharraqa) in Kushite lands. Petronius then sent deputies to the Kushites in an attempt to reach a peace agreement and make certain demands. This page is based on the Wikipedia article Nubia; it is used under the Creative Commons Attribution-ShareAlike 3.0 Unported License (CC-BY-SA). You may redistribute it, verbatim or modified, providing that you comply with the terms of the CC-BY-SA.